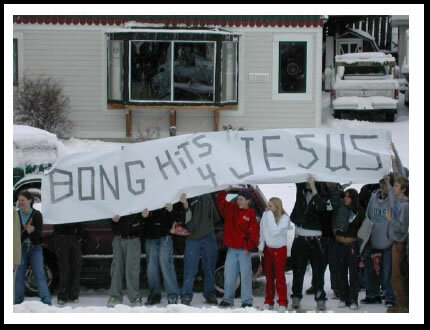 The week students returned from Christmas break was an interesting week, not in the least made more interesting by the appearance of a “Bong hits 4 Jesus” poster high on the ceiling of Homer High, 60 feet above the floor of the commons. This is not the first time “Bong hits 4 Jesus” has been seen among Alaskan students. Almost a decade ago, 18 year old student Joseph Frederick unrolled his 14 foot sign on a public street outside his high school in Juneau, Alaska. The principal of the school confiscated the poster and suspended Joseph, who then sued the school and took it all the way to the Supreme Court. The court ruled against him, and now the sign has shown up again, duct taped to the ceiling of Homer High. “We had borough maintenance come in to take the sign down, problem was the ceiling is 60 feet up and the lift only goes 40 ft. So we got a 20 foot pole with a knife on it and cut it down,” said Doug Waclawski.